Today is the official launch day for not only Microsoft’s Surface Pro 4, but also the Surface Book which was announced back at the Microsoft Windows 10 Devices event. There had been rumors of a larger form factor Surface Device, but launching it as a “The Ultimate Laptop” was certainly unexpected. Microsoft has tried to break the mold compared to the standard Windows Ultrabook, with a detachable display, which they call a Clipboard, and an optional GPU in the base. By moving the CPU and other components into the display, it has certainly freed up the base for extra battery capacity as well as the GPU, something that would not be thermally possible in a normal Ultrabook. I was lucky enough to receive a Surface Book at the event, but the pre-production unit that I received had a defective keyboard. Due to very limited supply initially obtaining a replacement unit was difficult, but Microsoft came through with another sample. Due to the time needed to swap I haven’t had time to do a full review yet, but being that this is the launch day it’s important to offer a preliminary showing on the Surface Book. 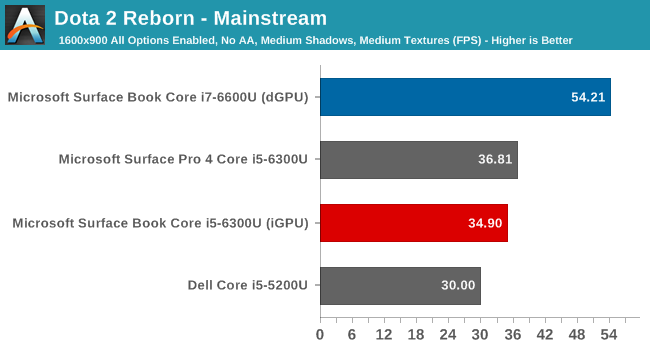 We have some results for both the base Core i5 model as well as the Core i7 version which comes with the NVIDIA GPU in the base. 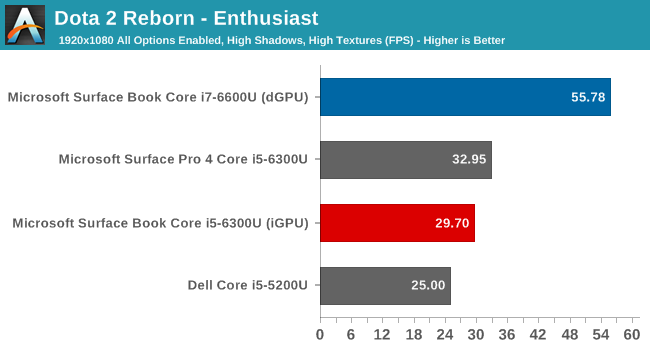 First, I think the one piece of information that most of our regular readers are curious about is the GPU. At the launch event, Microsoft was pretty guarded about what GPU model was in the Surface Book. Their specifications just listed it as an "NVIDIA 8G" part, which was a custom Maxwell based GPU. Taking a look at the GPU in our samples leads us to the conclusion that it is most certainly a GM108 based GPU, with specifications fairly close to the GeForce GT 940M. There are 384 CUDA Cores available, but the custom part is the memory. Normally GT 940M would come with 2 GB of DDR3 memory, and Microsoft has instead gone with 1 GB of GDDR5, trading memory capacity for improved GPU performance through additional memory bandwidth. This is a pretty typical tradeoff in lower-end GPUs, however to ship 1GB of GDDR5 in a mobile part in 2015 is quite unusual to say the least. Even GM108 should benefit from GDDR5 (thanks to its narrow 64-bit memory bus), but with only 1GB of memory it's going to be cramped. Moving on, the GPU connects over PCIe lanes provided by the Surface Connect port between the Clipboard and base. Microsoft does have Optimus enabled, with the default setting in the custom control panel for Auto-Select on the GPU, but you can also change to integrated or the NVIDIA graphics. There is no GeForce Experience installed, so in order to make the change you have to dive into the Control Panel. It’s not very elegant but I think the idea is that you just leave it in auto and let the whitelist handle when the dGPU is enabled. My experience so far is that the whitelist seems a bit bugged right now, and the dGPU runs all the time when the Clipboard is docked, which is clearly not the way it is intended to be. With the GPU information out of the way, let’s dig into what makes the Surface Book so unique. The basis of the Surface Book is that it is designed to be used as a laptop most of the time, but the display can be removed as a Clipboard for use with the pen. The Surface Book is certainly not the first device to do this, but it does some things in new ways that are pretty interesting. The display sticks with a 3:2 aspect ratio, the same aspect ratio as the Surface Pro lineup. This makes the Surface Book considerably taller than pretty much every laptop out there, with maybe the exception of the Chromebook Pixel if you want to count that. For what feels like too long, the standard Windows laptop comes with a 16:9 display, and even prior to that the standard was 16:10 which is slightly taller than 16:9. Moving to 3:2 on a notebook brings a lot of vertical space and makes it a lot easier to be productive on, at least in my experience in my short time with a review unit. The Clipboard itself is pretty nice too, and with the decision to not include any USB ports on the display section, it gave Microsoft the ability to make the tablet portion even thinner than the Surface Pro 4. At just 7.7 mm thick, it is noticeably thinner than the 8.4 mm Surface Pro 4 even though it doesn’t sound like a big difference. At just 726 grams, the Surface Book display is even lighter than the Surface Pro 4, despite the larger 13.5-inch display compared to just a 12-inch display on the Surface Pro 4. The way they got it so light was to not include much battery cacity, with the display only packing 18 Watt-hours. The idea is that the Surface Book is used as a notebook most of the time, but if you find occasions where the tablet would be handy, you detach, so really long battery life is not the priority. The base though is almost a blank canvas. By putting all of the major components in the display, not only have they made room for a GPU in an Ultrabook form factor, but they also have room for a lot more battery than most notebooks of this size. The additional 52 Wh of capacity in the base is as much battery as most Ultrabooks have. Combined with the 18 Wh in the Clipboard, the Surface Book packs in an impressive 70 Wh of capacity. I’ve run some battery tests already but I need to run a few more before I’ll have a good set of results so this will come with the review. 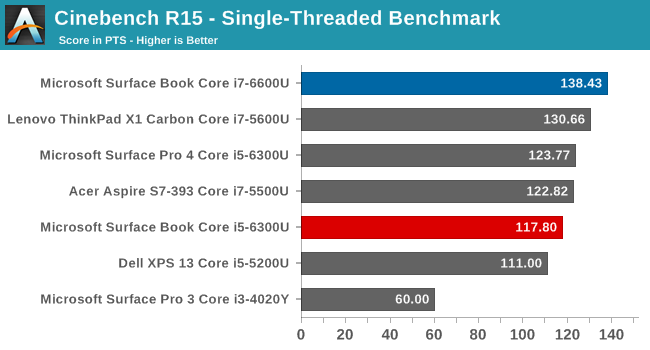 One thing the Surface Book does pack in is good performance. 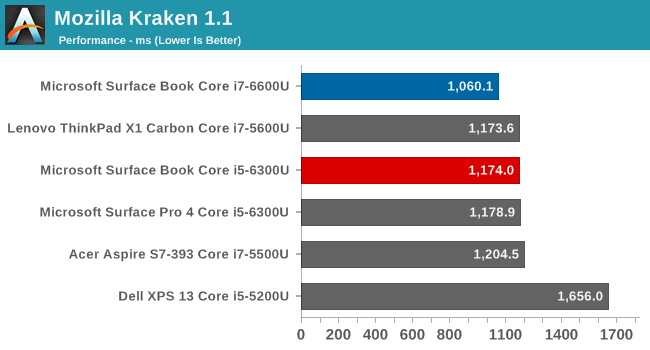 The Skylake 15 Watt processors are great for day to day tasks, and the GPU only puts it further ahead of most Ultrabooks. 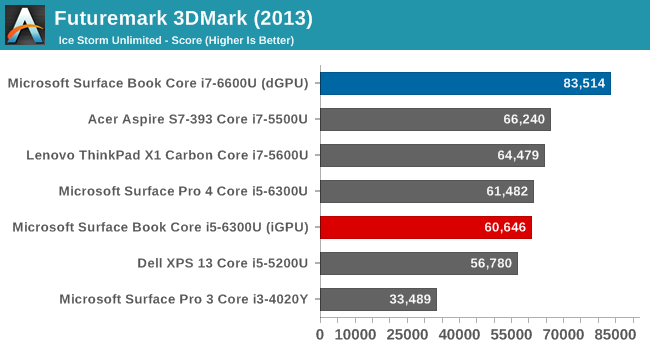 I’ll save the full performance figures for the review, but here’s a taste of what the GPU can bring to the table. Valve has recently revamped the Dota 2 game with a new Source 2 engine, and we’ve run a new version on a couple of devices to see how it fares. 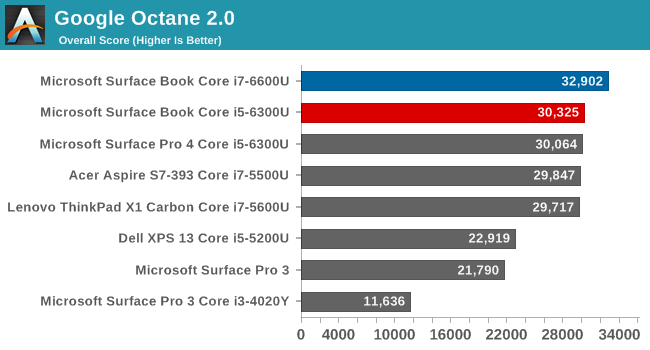 The performance increase of the discrete GPU is a sizable jump over the integrated graphics of Skylake, and by moving the GPU into the base away from the processor, Microsoft is able to put the GPU in its own thermal zone. 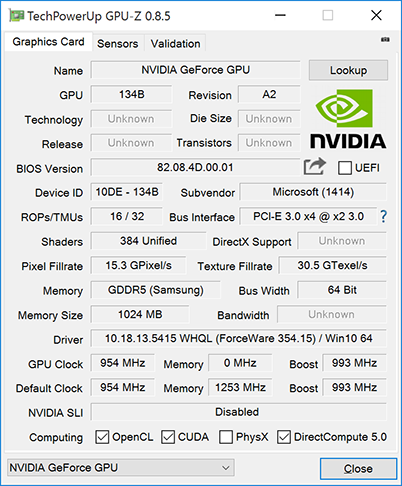 We don’t have exact TDP numbers from NVIDIA, but the GPU should be somewhere under 30 Watts. There is no way to fit that kind of TDP into a normal Ultrabook. 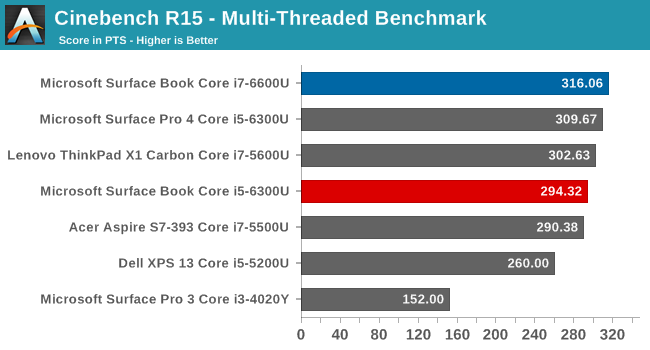 The Core i5 and i7 options offer performance right on par with other Ultrabooks too. Having a full 15 Watt Core processor in a 7.7 mm chassis is fairly impressive, especially since you almost never hear the fans kick in. 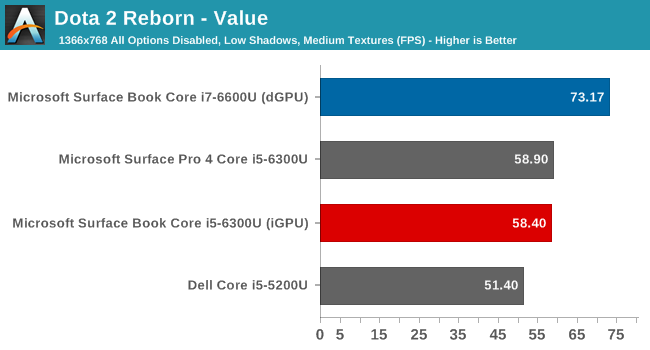 Here is a taste of the CPU performance. 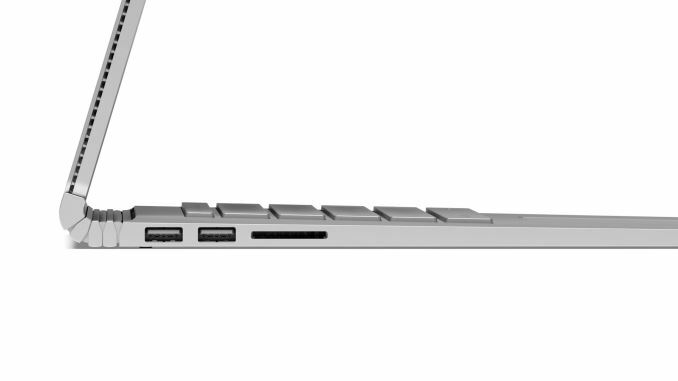 Obviously one of the signature design elements of the Surface Book is the hinge. I think this might be somewhat a love it or hate it idea. The hinge unrolls and actually lengthens the base of the notebook. Balance is the key here. With the majority of the notebook parts in the display, Microsoft is trying to avoid the one pitfall that most detachable 2-in-1s have, which is their tendency to tip backwards. By extending the base, Microsoft needs less weight in the base to overcome that balance issue. I’ve been told that the design means that they can get by with a 0.8:1 ratio of base mass to display mass. The other benefit of having the strange hinge which does not close completely is that the keys never touch the display. Most notebooks have the keyboard sunken in the deck, which reduces the maximum key travel. The extra room provided by the hinge lets Microsoft offer a 1.6 mm key travel on a very thin base. It also lets the Surface Book actually look like a book when it’s closed, which is a nice take on the design. The Surface Book is a very interesting take on the Ultrabook by Microsoft. I’ll need some more time with it to get a full review completed, but initial impressions are that it’s a solid device with a great display, a good keyboard, and a generous trackpad. The overall device is not as thin or light as some other Ultrabooks, but generally those don’t pack in 70 Wh of battery and a real GPU. Stay tuned for a full review soon. It blows my mind that they didn't go with 2gb vram, and it's even more of a travesty they didn't go with a downclocked GM107 GPU, a la GTX 950m. It shouldn't have been too hard since it'd be the only component requiring active cooling. You're talking about the part in this year's model? Since it was branded ad a custom part, I doubt it is a partially disabled die harvest. It looks like a gm108 with a "custom" gddr5 setup, as proposed in the article. I wouldn't call it impressive. I'd call it useless waste of space and power. The dGPU they chose is faster than GT3e. Yet it can be located in a separate compartment - hence installed in the keyboard section (splitting the thermal load up nicely). GT4e might be about as fast, but it didn't fit in their thermal envelope.